Easily convert your PDF files into fully editable Microsoft® Word documents. 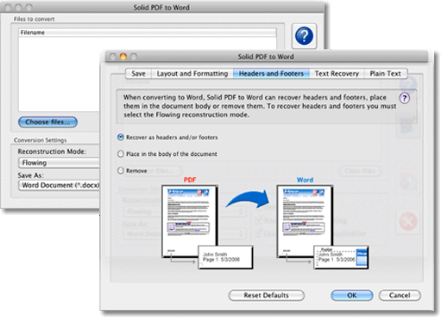 Convert scanned PDFs to well formatted, editable Word documents using Solid OCR. Extract and re-use tables from your PDF files into Microsoft Excel worksheets and .xlsx or .csv. Use advanced document reconstruction to convert PDF to formatted W3C-compliant XHTML. Formats columns. Remove headers, footers and images. Extract flowing text content from PDF. Header, footer and column options available. Convert PDF to iWork Pages (.pages) and retain text, images, page layout, tables, headers/footers (by importing .docx into Pages). Save time on reformatting and reworking your converted Word File. Reconstructs bordered and borderless tables as table objects, with formatting, in Word. PDF form fields are recognized and converted into text boxes for easy editing in exact reconstruction mode. Convert text from your PDF, no matter the orientation. Save time by selecting and converting multiple PDF files at the same time. Copyright © 2019 Solid Documents Limited. All Rights reserved.